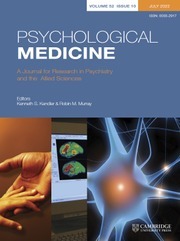 Now in its fifth decade of publication, Psychological Medicine is a leading international journal in the fields of psychiatry, clinical psychology and the related basic sciences. There are 16 issues a year, each featuring original articles reporting key research being undertaken worldwide, together with literature reviews and shorter editorials by distinguished scholars, as well as an important book review section. The journal's success is clearly demonstrated by a consistently high Impact Factor.